The resolution, stability and peformance of a Piezo Nanopositioning Controller significantly contributes to the overall accuracy of a nanopositioning system. Digital servos provide advantages over analog circuits when high positioning linearity is important or when control parameters need to be modified frequently. This could be the case when load changes occur or when different motion profiles need to be optimized for minimum settling time or optimum tracking accuracy. Analog servos are usually less expensive than digital servos. If designed well, they provide very low noise and fast response at a very attractive price. All PI piezo nanopositioning controllers come with tunable notch filters and provide the highest closed-loop bandwidth in the industry. 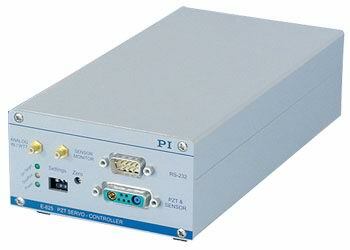 The E-709 piezo nanopositioning controller is the most cost effective full featured digital piezo controller available. 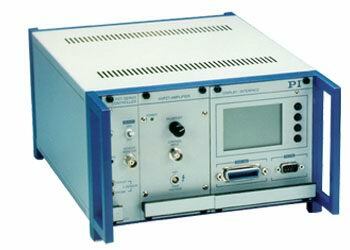 It provides the flexibility and adaptability of a digital signal processing unit for the cost of an analog controller. Digital 5th order polynomial linearization algorithms can improve the motion linearity of the attached piezo positioning system significantly over an analog servo system. The unit features a variety of digital interfaces as well as an analog input and output. The analog input can be configured as position control signal or as a sensor value. Fast Digital Servo, All Parameters Configurable in Software, Change of Settings "on-the-fly"
Two versions available: for low cost strain gauge sensors and for high performance capacitance sensors. The analog output can be switched to provide either a signal analogous to the position or to control an external power amplifier should more current be required than can be provided by the internal amp. The E-753 digital piezo controller is a high-end nanopositioning controller designed to meet the most demanding accuracy and dynamic-performance requirements of nanopositioning systems of the highest precision class. The E-609 is an OEM controller that opens up the possibilities of digital piezo control for for the same price as analog controllers. 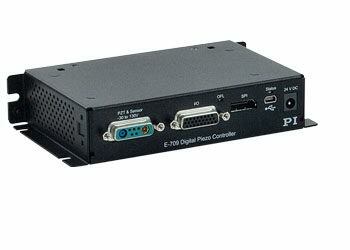 All signal processing in the E-609 is purely digital, and the digital servo can be easily optimized and tuned via the USB interface and the included software. 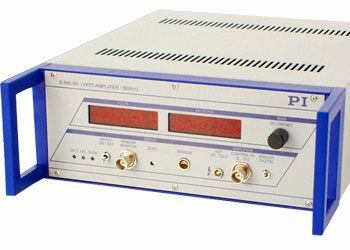 For ease of integration in applications with analog control signals, the unit is controlled via a 0 to 10 V signal. The E-625 piezo nanopositioning controller is equipped with a high speed USB interface and precision 24-bit A/D converters for exceptional positional stability and resolution. 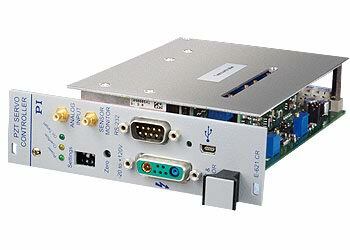 It also provides an analog command interface and a serial RS-232 connection. 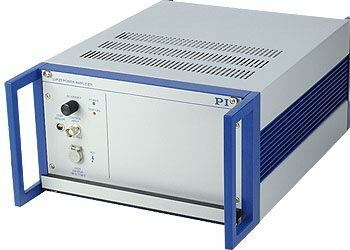 A low-noise piezo driver capable of providing 120 mA current is integrated. The E-665 provides more current (360 mA peak) than the E-625 and also adds a display and manual controls in a bench-top metal case. Versions for both position capacitive and strain gauge feedback sensors are available. 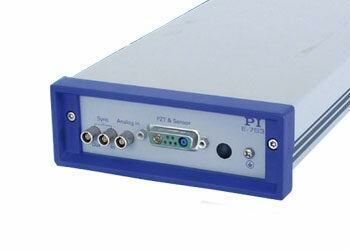 The E-621 is the OEM version of the E-625 bench top unit. It can also be installed in a special E-500.621 rack for up to 12 channels. The E-610 is an OEM closed-loop piezo controller with integrated low-noise piezo driver It can provide peak currents of 180 mA in a voltage range of -20 to +120 V. Versions for both position capacitive and strain gauge feedback sensors are available. 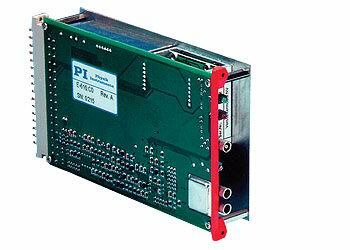 The E-500 / E-501 rack is a very flexible modular piezo controller system that can be configured in hundreds of ways. 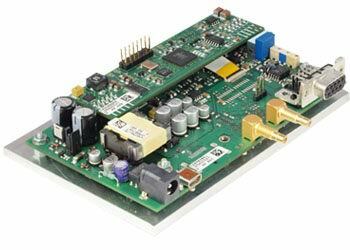 Different amplifier modules, interface modules sensor modules and servo controller modules allow the systems to be adapted to a wide range of applications. E-500 systems are assembled to order, tested, and, if a servo-controller is present, calibrated with the associated piezo mechanics. 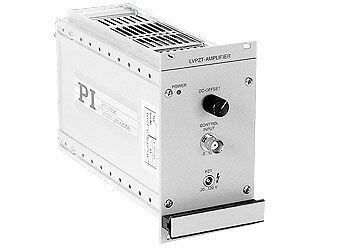 The E-618 high-power amplifier/controller is specifically designed for ultra-high-dynamics operation of piezo actuators (translators). It can output and sink a peak current of 20 A and an average current of 800 mA in a voltage range of -30 to 130 V.
The energy recovery circuit makes the E-617 an exceptionally efficient, high-power, piezo driver, for high-capacitance piezo actuators at frequencies in the kilohertz range. 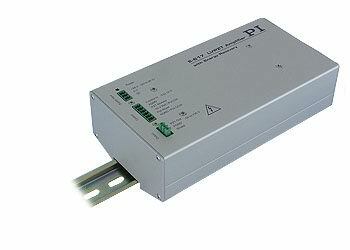 Providing peak power of up to 280 W and average power of 100 W, it can output and sink a peak current of 2000 mA.